THE PLAN: Switch up your diet. At this 134-room spa resort in Tucson, nutritional programming guides guests on mindful grocery-shopping decisions, anti-inflammatory cooking techniques, and optimal food and vitamin combinations. On your quest to achieve mind-body balance, you’ll be pampered every step of the way with a panoply of spa treatments, meditation and yoga classes, equestrian programs, and, of course, decadent dining that’s actually healthy. Equine therapy at Miraval Arizona. THE PLAN: Find holistic harmony. Anantara Peace Haven, tucked away on a 21-acre coconut plantation overlooking the Indian Ocean, recently introduced seven-day Ayurvedic journeys. The deep dive into 3,000-year-old traditions helps participants understand their prakruti (natural state) and vikruti (current imbalances). Personalized programs at the 152-room resort incorporate bespoke treatments, Ayurvedic cuisine, a technology detox, and meditation, all while integrating Sri Lanka’s abundant charms into the experience, with excursions to Buddhist temples and painting lessons with local artists. THE PLAN: Work up a sweat. With its eight-day, all-inclusive weight-loss retreats, this 155-room resort proves that the best place to get your beach body is at the beach. Each morning, choose from yoga, volleyball, sailing, spin class, waterskiing, Caribbean dance, Zumba, and many other activities, then get your heart rate back down with aromatherapy massages, oxygen facials, and thalassotherapy. The reward for all that hard work: a splash in the Caribbean waters beyond the resort. THE PLAN: Say addio to insomnia. Seek out a good night’s sleep at the 93-room Lefay, a dreamy lakefront resort in northern Italy. Its six-day sleep detox program helps you calibrate your snooze cycle and keep insomnia at bay with an itinerary designed to identify energy levels and bring inner harmony through spa treatments, acupuncture, reflexology, saltwater pool sessions, custom phytotherapy (the use of plants and herbs for healing purposes), and more. 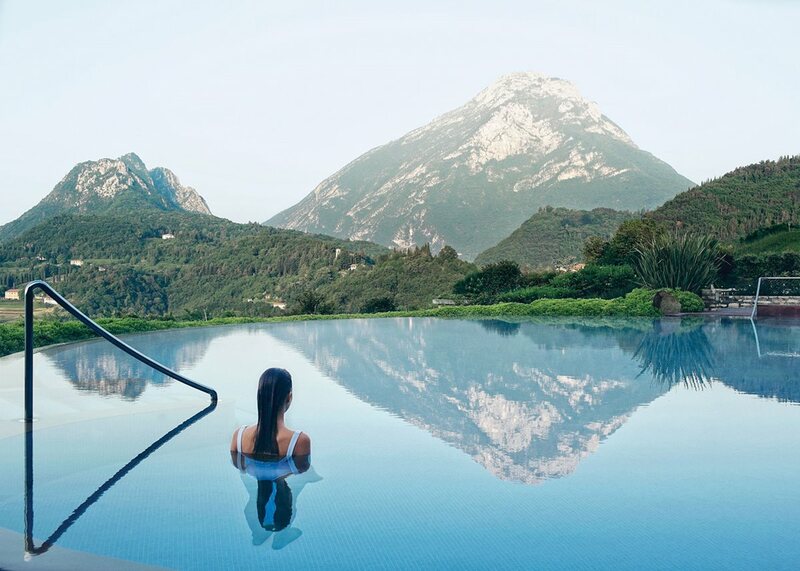 Soak, then sleep, at Italy’s Lefay Resort & Spa.